- 2500 years ago, Thales (pictured above) discovered that if he rubbed a piece of amber with a silk cloth, the amber would attract small bits of grass, feathers, and other light objects. The amber had become electrically charged. - In 1570, Gilbert did more experiments like those of Thales and called this electrical charge electricity. - Every living and non living thing in the universe contains electricity. - Electricity cannot be seen. It is produced by the movement of tiny particles called electrons which are found in atoms. Every living and non living thing is made up of atoms. The center of an atom is called the nucleus. 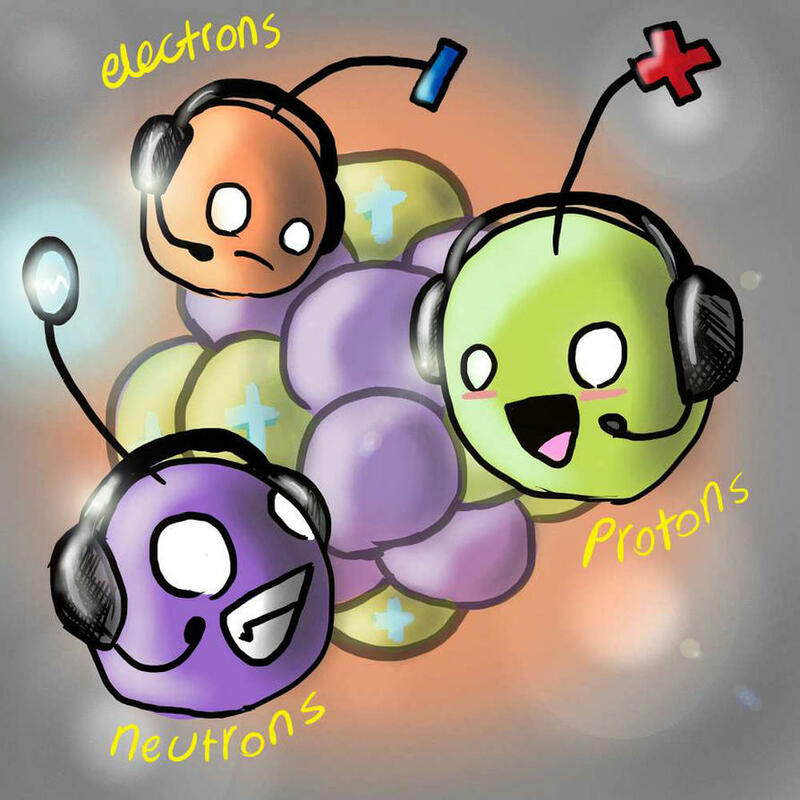 The nucleus contains protons (positively charged particles +) and neutrons ( neutral or no charge ). Electrons (negatively charged particles -) orbit around the nucleus just like planets orbit around the sun. It is when these electrons free themselves from the atom and start to move out of their paths that they form electricity! The atom usually has an equal number of protons (+) and electrons (-) therefore it has no electrical charge. Some atoms lose or gain electrons (only electrons) so they become either positively or negatively charged. Objects with different or opposite electrical charges attract one another. Objects with the same electrical charge repel one another. 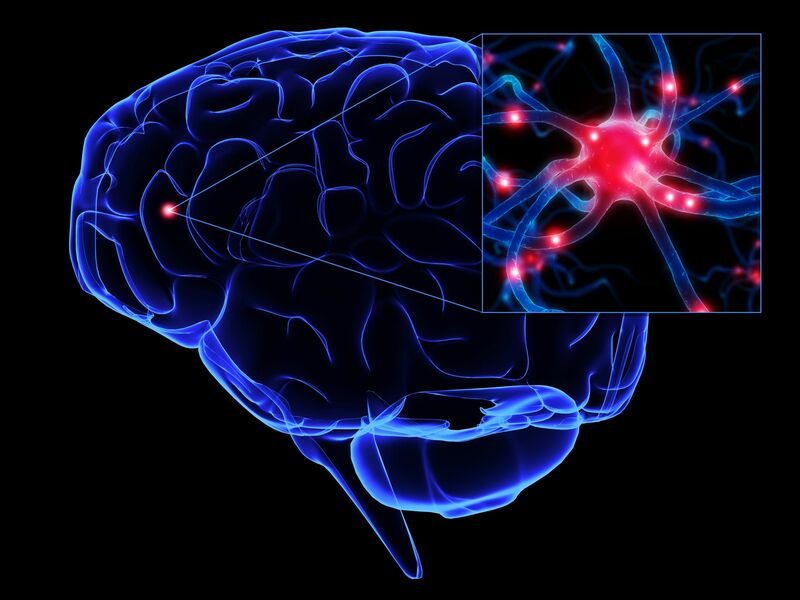 When a large number of atoms in an object gain or lose electrons, the object becomes electrically charged. When objects carry an electrical charge, static electricity is present. When we rub certain objects against one another, we create friction which produces the static electricity. Static Electricity is electricity at rest. A charged object will also attract something that is neutral (no charge). Think about how you can make a balloon stick to the wall. If you charge a balloon by rubbing it on your hair, it picks up extra electrons and has a negative charge. Holding it near a neutral object will make the charges in that object move. There are more positive charges closer to the negative balloon. Opposites attract. The balloon sticks. (At least until the electrons on the balloon slowly leak off.) It works the same way for neutral and positively charged objects. So what does all this have to do with static shocks? Or static electricity in hair? When you take off your wool hat, it rubs against your hair. Electrons move from your hair to the hat. A static charge builds up and now each of the hairs has the same positive charge. Remember, things with the same charge repel each other. So the hairs try to get as far from each other as possible. The farthest they can get is by standing up and away from the others. And that is how static electricity causes a bad hair day! As you walk across a carpet, electrons move from the rug to you. Now you have extra electrons and a negative static charge. Touch a door knob and ZAP! The door knob is a conductor. The electrons jump from you to the knob, and you feel the static shock. We usually only notice static electricity in the winter when the air is very dry. During the summer, the air is more humid. The water in the air helps electrons move off you more quickly, so you can not build up as big a static charge. The Law of Electrostatics states the like charges repel and unlike charges attract. 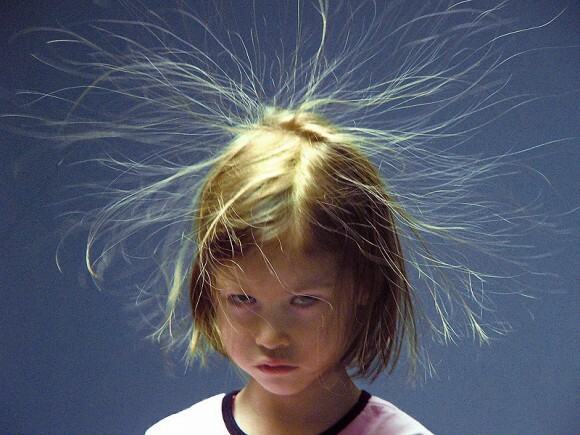 When a large number of electrons stay in one place it is called static electricity. When electricity flows through a material (like a wire), it makes an electric current. The electrons in an electric current are constantly moving in one direction. This is called current electricity. The flow of electricity produces energy which may be converted to heat and light as it flows through electrical devices. Circuit: A complete path that the electrons follow in order to form an electric current. Closed (or Complete) Circuit: when all 3 parts of the circuit are connected so that the energy is flowing. Open (or Incomplete) Circuit: when any of the 3 parts are disconnected and the current is not allowed to flow. Series Circuits: When output devices are connected in a chain to an energy source. The current passes from one output device to the other. There is nothing that gives us electricity directly. It has to be made or generated. Electromagnet: When a coil of wire is wrapped around a metal object and connected to an energy source, the metal object will become magnetized. An electromagnet will attract magnetic materials and can be made stronger by increasing the number of coils of wires. They are only temporary magnets because they only work if the energy is flowing. Oersted discovered the relationship between electricity and magnets. Faraday was the first to discover that a magnet could cause an electric current to flow through a wire. By moving a magnet back and forth through a coil of wire, an electric current flowed through the wire. When the magnet stops moving, the electricity stopped flowing. Faraday invented the first generator. Battery: uses chemicals to create electricity. Allessandro Volta made the first battery. He put two different pieces of metal (electrodes) in a salt solution (electrolyte). Then he placed a piece of wire between the electrodes and found that an electric current was created. Electromotive Force: the force that electrons need to push them along the wire produced by a battery. Volt: strength of force is measured in volts. We get electricity from huge power plants that have giant generators. The generator at a power plant is just a large electromagnet. A huge magnet spins quickly inside a coil of wire which produces an electric current. The generators need energy to turn. They get their energy from steam engines which get their energy from coal, oil, water pressure or nuclear reactions (depending on what type of power plant it is). Hydroelectric: uses water pressure to produce the energy to spin the generator. Large amounts of water are held back by a dam then the water is allowed to flow to a turbine (has blades which spin as the water hits them). The turbine is connected to the generator arm that holds the magnet so when the turbine spins, it causes the magnet to twirl inside of the coil of wire. Fossil Fuel (gas, coal, oil): formed from the remains of prehistoric plants and animals trapped underground for millions of years that eventually turn to coal, gas and oil. They are burned in huge furnaces which heat the water and turn it to steam and the steam is used to turn the blades of the turbine. The steam then passes to the condenser where it changes back to water and is used again. Nuclear Power: work in the same way as fossil fuel plants except steam is produced in a different way. The heat is created by using pellets of uranium. Fission occurs which causes the atoms of uranium to split which gives off a lot of heat energy. The heat is used to make steam the same way as fossil fuel and hydroelectric plants. Fusion: Occurs when the atoms join together instead of splitting apart which would also create a lot of energy. It takes tremendous pressure and extremely high temperatures for this to happen and nobody has been able to design a container that could hold it...yet! 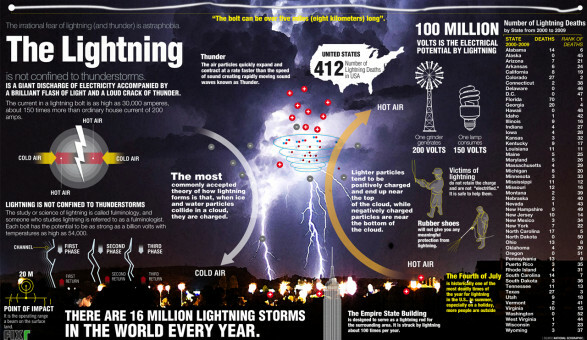 What happens after electricity is generated? The electricity leaves the power plant through transformers which increase the voltage or push behind the electricity to send it on its way to be delivered to people and industries.